You might be used to configuring modulation with a source, destination, and possibly scale in a matrix layout. Instead of this typical formula, VK-2 offers a setup more like a modular synth. Each module has it’s own parameters that can be modulated, with the parameter having its source selected in a display in the module section. With this configuration, the source is chosen at the destination. That doesn’t take into account scaling though, which is where the mod busses come in. In many cases you would want to scale the modulation amount with another signal. The most common example is to scale the modulation by the mod wheel so you can control it during a performance. Source – This selects the source of modulation to be scaled. Very frequently this would be an LFO or envelope. Scale – This selects the scale signal. You may often want this to be mod wheel, aftertouch, or velocity. Scale Amount – You can have the modulation be scaled less than 100%, so some modulation will always occur. Keep in mind that the mod busses are audio rate. 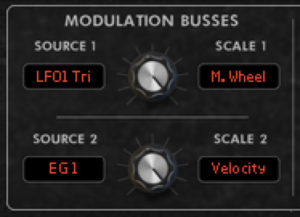 You can set up Ring Modulation in the mod busses. See the FM/AM/RM tutorial for more details. Now you know the basics of the mod busses, you will end up using them frequently once you know they’re there.